Home / Model Supplies / Adhesives / Nitrocellulose Cement / Duco Cement, 1 oz. Duco Cement is a nitrocellulose based general purpose model cement. Duco is a fast drying, non brittle, easily sanded model cement that creates a bond at least as strong as the surrounding balsa wood structure*. 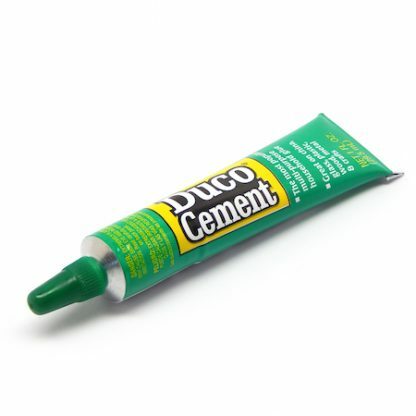 We recommend Duco Cement for traditional model building techniques (double gluing works best). Duco Cement pairs well with light weight fiberglass cloth, as a method to reinforce sheeted structures on balsa gliders. Often used in place of the discontinued Ambroid glue product. Type Nitrocellulose Model Cement | Color Clear | Volume 1.0 oz.